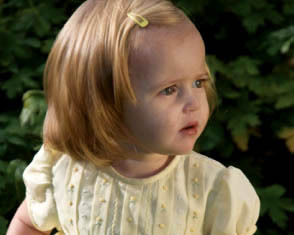 This sweet old fashioned style yellow cotton blend voile baby dress is made by Sarah Louise, a top British designer of beautiful baby garments. It features a tucked bodice accented with yellow rosebuds, delicate white embroidery, and yellow featherstitching. This darling little dress has a simple round neckline and short puffed sleeves finished with featherstitched sleeve bands. The smocking is embroidered with yellow rosebuds, which also top the deep 3½" reverse scalloped hem. The dress has an attached petticoat for added fullness. It closes in the back with three small buttons and sizes 12 months and up have a sash to tie in the back. The perfect portrait dress, birthday dress, or special occasion dress for your baby or toddler girl!